One day, my wife and I were discussing homemade barbecue sauce and the different kinds I’ve made. Now, I fancy myself a creative beast when it comes to sauces and rubs. So, it was upsetting to me that her favorite sauce that I make was someone else’s. 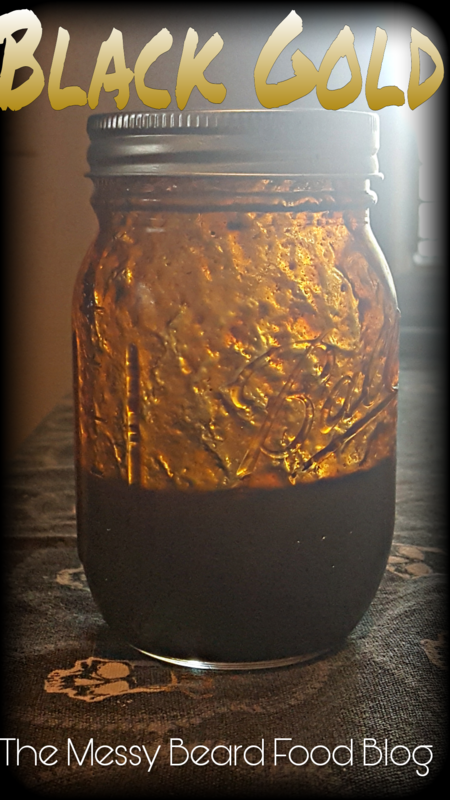 To sound completely cliche… It was a day in the middle summer, and I was stewing after our conversation about sauce, so I decided to create this Black Gold sauce. she hasn’t killed me yet for all my “oh no” moments. I am pretty sure she was glad I came up with this one though! Creating sauces is something I love doing. I take pride in the reactions I get. That being said, I prefer tomato based sauces just due to the texture and appearance. I love a full bodied, thick, and layered in flavor sauce. To me this sauce is a perfect blend of spicy and sweet which can apply to all types of meat. Nothing better than a sauce that can be used for everything. I stood in my kitchen, looked at my array of spices, and thought about where to start. I was looked at the bottle of whiskey that had been laying around and thought, what’s the worst that could happen? Then, I found my chipotles in adobo, and just went for it. That’s when I started introducing the molasses, honey, and brown sugar. Fun Fact of the Day – I hate using ketchup in sauces. I feel like it is cheating in a way, but I knew it was being used along with apple cider vinegar. Those two ingredients are in almost every barbeque sauce. With adding all that sweet, I lost the heat. Which is when I decided to add the Chipotle Powder. The powder isn’t as potent as the chilies in adobo. 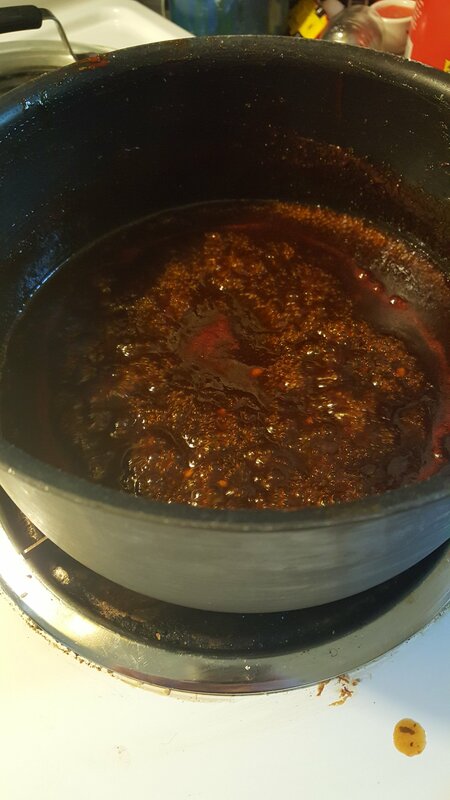 The remaining spices create a good base to build any good sauce. I used cornstarch to get that thick, thick sauce. If you personally don’t want that, don’t add it to yours. After all ingredients are combined, bring to a boil, and reduce it to a simmer. Let it reduce by about a third. It can be used right away or kept in your fridge a few months. 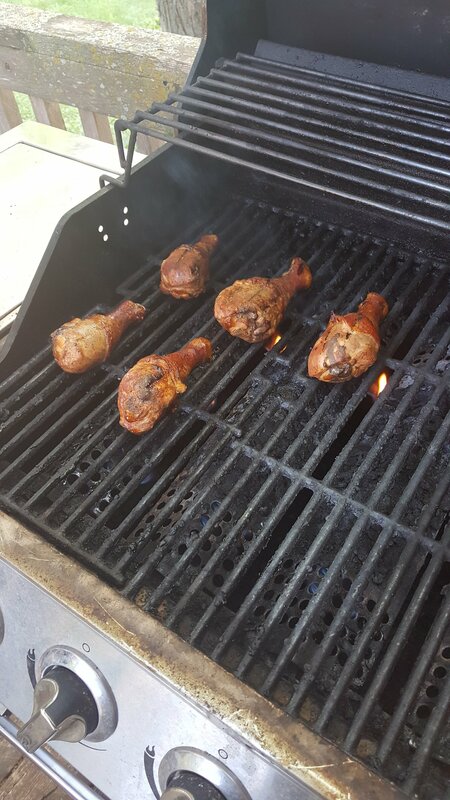 Now when I glazed those chicken legs, it created an amazing result. Causing mouth watering, saucy and crunchy skin, with a bite of heat. This has become my go to sauce for anything barbecue. The best part? My wife loves it! This sauce is going to leave your mouth wanting more of it. I use it mainly as a finishing sauce to give it that crunch. You know, it gives you those goosebumps and turns you into the macho man? OOOOH YEAH!! 2 tsp Chipotles in Adobo sauce. Just the liquid. In a medium saucepan, add all the wet ingredients, and combine well. Once combined, add all the dry, and combine again. Bring to boil- while heating be sure to taste and adjust as wanted. Once boiling, reduce to simmer until sauce starts to reduce and thicken. About 20 to 30 mins. Use right away if not, it will keep in the fridge for a couple months. Got a question, comment, or a experience you would to share? Leave a comment or contact me! They could use some of your chicken (and sauce) out at the Crew. Thanks! Its a combo that packs a punch!